In a large pan with a steamer insert with a little water in the bottom of the pan, steam the asparagus for 5-7 minutes until tender. Remove from heat. In a small skillet, brown the walnuts for 2-3 minutes until golden. 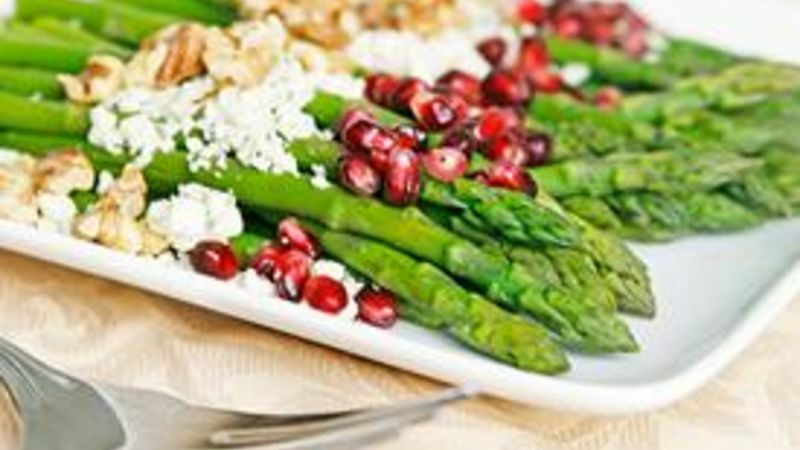 Arrange the asparagus on a plate. Top with crumbled blue cheese, pomegranate arils and toasted walnuts. This can be served immediately (hot) or at room temperature. Thanksgiving ready in just 15 minutes! Make this beauty of a side dish for your Thanksgiving table. It’s November. That means that I am embroiled in wild-eyed planning for two birthdays and my epic annual Thanksgiving dinner. But really, it’s Thanksgiving that captures most of my attention always. Like I said, my dinner is epic. Planning my menu for Thanksgiving is a trial in patience and organization. I am fortunate to have six burners, two ovens and a rotisserie to work with. The turkey always goes in the rotisserie, rendering a juicy, easy, hands-off bird without hogging up one of my ovens. It takes a mere 15 minutes to make and can be served hot or at room temperature. It’s delicious either way. This is a great way to take good ol’ steamed asparagus and make it something really special.